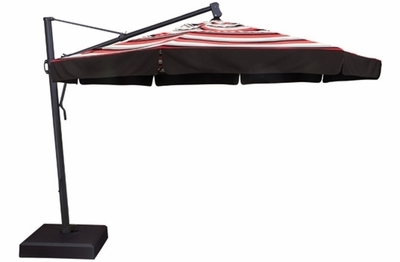 When the sun is beating down on your gathering, this Treasure Garden large 13' cantilever octagon umbrella has you covered. Its offset design is the perfect way to shade any space where standard center pole umbrellas are unwelcome. With its fade resistant fabrics, this patio umbrella will retain its beauty along with its bold colors season after season. The aluminum pole is strong and sturdy and able to handle the toughest weather conditions with ease. The off-set design is superb for your deep seating set, chaise lounges or your larger dining arrangements. Easily rotate your outdoor umbrella 360 degrees with the handy foot pedal and it will tilt nicely at 18, 36 or 54 degree angles giving you the versatility you desire. This high quality cantilever umbrella is suitable for either personal or commercial use. So keep the sun at bay and let your party play with this attractive patio accessory. * Weight: DWV: 94.6 lbs DWV w/optional Valance: 95.6 lbs. * Pole Diameter: 3.86" x 2.56"
* Coverage: 133 sq. ft.